Transportation policy should not be adjusted for these type of rental car schemes, no matter how trendy for some people. Most adults with families and businesses have much different transportation needs than “zipcar” subscriptions can meet. Zipcar should be treated like any other business. Planners should plan for reality. Zipcar came to Marin because people asked them to come, not because San Rafael encouraged it. While Zipcar cannot be the only transportation, again, it can fill a niche. There’s no need to be monomodal, whether it’s cars, transit, foot, or bike. Especially in a place like Marin, car-sharing can free some people to sell their car, just not everyone. If we want to plan for reality, we shouldn’t plan just for families; we should plan for everyone and their whole diversity of needs. There are other car-sharing companies out there, and any regulation that takes advantage of how people shift travel patterns while members of such services should absolutely business-neutral. For the record – AVIS bought Zipcar this year. Apparently they think it’s a different enough model that they needed to invest in it. Stephen, Zipcar is not revolutionary but it is successful and filling a niche (along with similar companies and non-profits, like CityCarShare). Its convenience and widespread availability (ie. in many neighborhoods in SF) are part of its appeal and success. 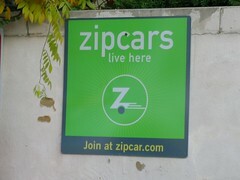 Unlike a typical rental car, a Zipcar is easy to obtain in one’s own neighborhood (in many urban areas).